We've talked a bit about Bisimoto's wild 911 in the past. The car made its debut when it was featured on Matt Farah's Tuned show back in late 2015, and has been periodically spotted at SEMA and Luftgekuhlt—despite being watercooled—events since. Bisi actually tried to sell the car at a Mecum auction in 2016, but it didn't meet reserve. This car has long been a favorite of ours for the simple fact that it is about as crazy as you can get while still looking like a Porsche. And who doesn't love the idea of 850 horsepower in a package under 3000 pounds? This car was first built back in 2007, and has been refined ever since. Back then an average mid-year 911 was going for very little money, and the M96 engines were already being derided for detrimental intermediate shaft bearing failures. By taking two things that are hated in the Porsche world and improving them until the car was undeniably awesome, Bisi made the haters sit back down. With just a standard 996 Carrera engine and 6-speed gearbox, this contraption would have more than doubled the 1975 911's original horsepower output, as the early 3.6-liter engines produced 315 horsepower, while a 75 911 made do with a 150 horsepower 2.7-liter. That wasn't good enough for Bisi, however, as he then added a pair of huge turbochargers to the completely rehashed Carrera engine and forced another five hundred plus horsepower out of the little flat six. In this video with Hoonigans, Bisi Ezerioha walks through every bit of his IROC-inspired 911's upgrades. 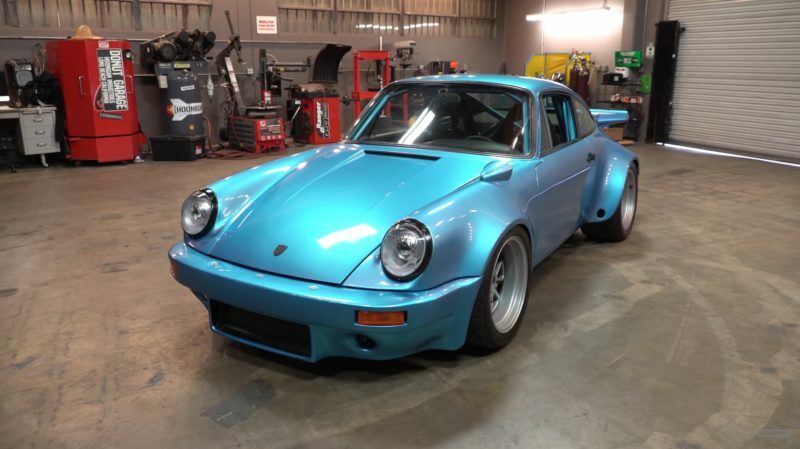 With huge wide fenders and giant grippy tires, this car looks and feels more like a Turbo RSR from the early 1970s, especially with giant turbos hanging out back exposed to the world. It's an incredible build that you need to see to believe.